The meal was a lot of work, but not because of this quiche--it came together pretty quickly. The presentation was lovely and the taste and texture buttery. I wish I could say that I had made my own crust, but I wimped out and bought a store-made one. I made up for that with local asparagus, eggs, cream, and bacon. The presentation is stunning and makes it a great potluck dish. Preheat your oven to 375 degrees F. Cut a piece of parchment paper to fit the bottom of your tart pan. Place the dough in the tart pan and press against the sides. Trim or fold the excess over into the side of the pan. Cover with foil and fill with pie weights (or uncooked rice). Blind bake the crust for 12 minutes. Remove from oven and set aside to cool. Set aside enough asparagus to decorate the top of your quiche. Cut the rest into 1-inch lengths. Saute the asparagus pieces (not the decorative pieces) with the leeks over medium heat until the leeks start to soften, about 5 minutes. Set aside. In a large mixing bowl, beat together the eggs, cream, nutmeg, salt and pepper. Add the bacon and cheese and mix well. 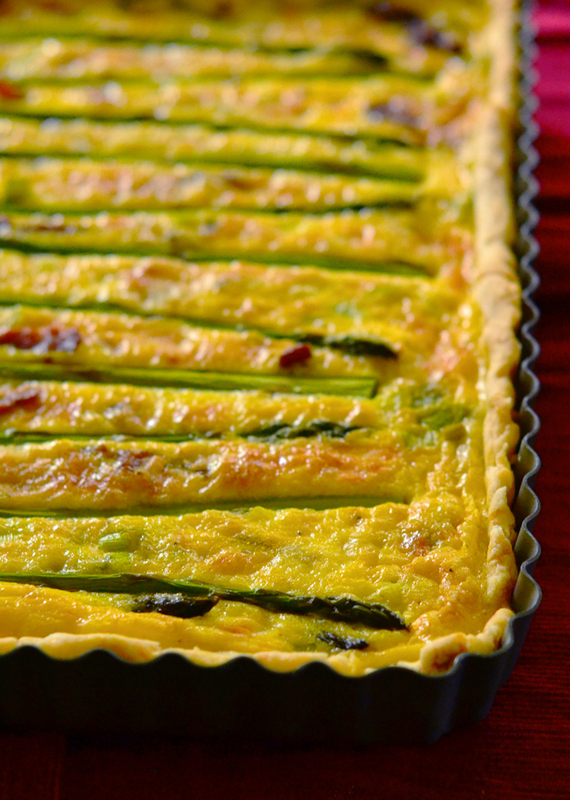 Spread the asparagus pieces and leeks on the bottom of your tart crust. Pour the egg mixture over the vegetables. 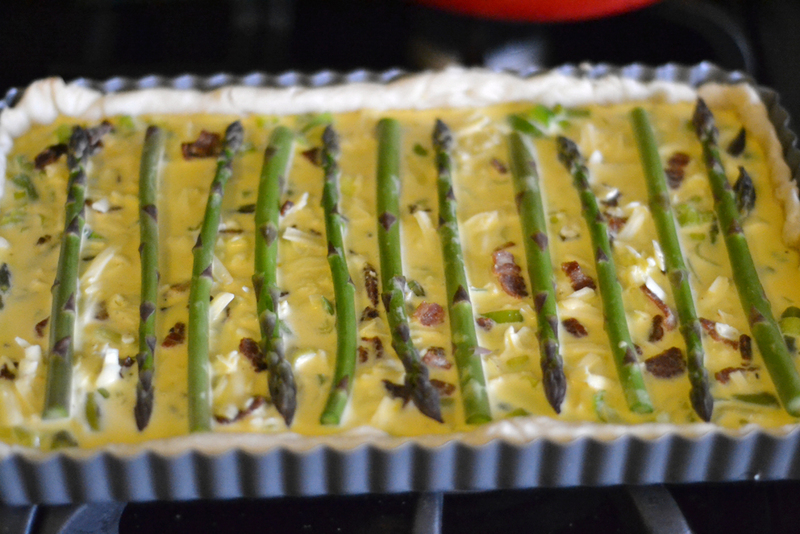 Decorate the top with the rest of the asparagus. Place the tart pan on a baking sheet and bake for 30 minutes or until the top starts to brown and puff up. Serve warm or at room temperature. Ummm that is beautiful and so yummy looking! I have been going asparagus crazy lately! this looks so decadent and yummy! 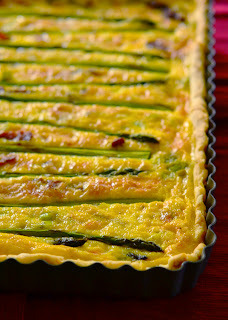 i love using asparagus for quiches and frittatas etc... anything with eggs! These are found with different costs which might be affordable by any kind of customer.Most of the times, ladies have affinity towards branded products. If we talk of handbags, then Mulberry handbags appear in high quality option and they are generally very popular by nature.Many mulberry handbags accompany the produced in China tag as the majority of the bags will be outsourced to China replica bags and Turkey.But market is faking handbags, that are only the replica on the original ones. So, you have to be over-cautious before you choose handbags from this company. This brand represents the British lifestyle.